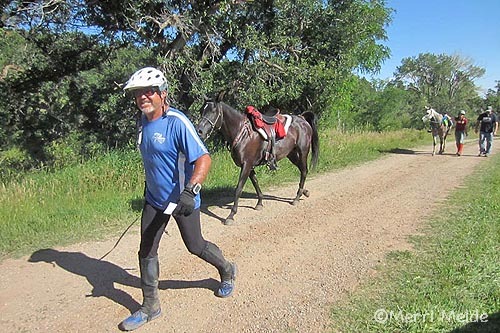 If you type "Kenlyn" under horse history on the AERC website, you'll come up with nearly 100 Kenlyn Arabian horses who have been down the endurance trail with their owners. In 2011, seven Kenlyn-bred horses finished Tevis. In 2014, four Kenlyn-bred horses finished Tevis. Kenlyn horses have been AERC National LD mileage champions numerous years. Kenlyn Psyche+// (TW GG Psyche X Sacred Rendezvous, by Bask Flame), owned by Lynn Oslick, is still going strong, with 5235 miles in 15 seasons of endurance. Kenlyn Struts (KL Alkatraz Tu X Devosion, by Safire), owned and ridden by Linda's sister, Carol Bischoff, was 2017 first place National Limited Distance Mileage Champion. "Carol has the same bad knees as I do, so she won't ride past the LDs!" Linda said. And it was only about 7 years ago that most of Linda's horses were named with the Kenlyn prefix. There are a lot out there that people don't realize were Kenlyn-breds. One phenomenal Kenlyn horse missing that prefix is Hannah Pruss' Kourageus Hope. More of you probably know him as "Stuart" the one-eyed horse. Linda calls him a "grandchild," since Hannah bred her mare Shazams Zhope (by Ibn Shazam) to Linda's stallion Kourageus. Stuart currently has almost 1700 AERC miles in 8 seasons, 27 completions in 29 starts, two Tevis finishes (9th and 15th), 6 out of 7 100-mile completions, 13 Best Conditions, and twelve first-place finishes, including the Big Horn 100 twice. Hannah and Stuart finished second in the 2017 AERC 100-mile Championship in Colorado by a nose, and were awarded Best Condition. They ended up third in the 2017 National Best Condition standings. Another home-bred horse Linda likes to mention is Kenlyn Kourvy, a 2010 mare by Linda's stallion Awesome Knight out of Kourvaceous, currently being ridden by Taylor Fisher - and that brings us to one of Linda's human grandchildren. "She's my little clone!" Linda says of her 14-year-old granddaughter Taylor. "She rides just like me - in fact she can outride me, and she breathes horses just like I did. Her father, my son, wasn't interested in horses, so I guess it skipped a generation. Taylor lives in Ft Collins, 80 miles from me. So when I could, I used to train together with her and teach her. I started riding endurance with her and her little sister Samantha. Sammi will ride now when she has to, but she doesn't have quite the enthusiasm that Taylor has." 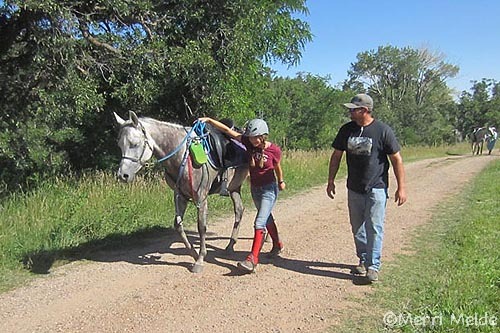 Taylor's first endurance ride was at age 5 in 2009, in a 25-miler aboard one of her grandmother's horses, Tupelo Honey Tu+, riding, of course, with Linda. "Because of my bad knees," Linda said, "I've held Taylor back - she's been riding with me on the Limited Distance rides. But last year I let her go and I put her with all my 50 miler friends, and she was able to do the 50s." Taylor not only started riding 50's in 2017, but she logged a total of 405 endurance miles, and she qualified for, and won, the Junior AERC National Championship 50-mile honors in Colorado in August, riding Kenlyn Kourvy. Taylor's sponsor for that ride was Steve Downs, of Phelan, California, riding Kenlyn Porsche (Night Runner GWA X Mahoganaska, by Padrons Mahogany). That's one of three Kenlyn horses that Steve currently owns, the other two being 7-year-old Kenlyn Sonata (Awesome Knight X Kenlyn Steele, by Remington Steele), and 6-year-old Kenlyn Hot Shot (Pistol Pete X Baska Flamin, by Bask Flame), who's due to make his first endurance start in January. 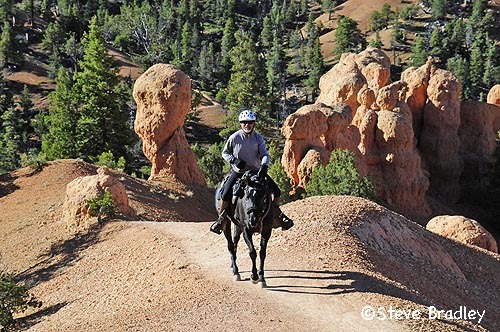 In only the last two seasons of riding, Steve racked up numerous AERC Regional awards and CSHA (California State Horsemen's Association) awards with both Porsche and Sonata. Additionally, Steve finished Tevis in 2014 on a loaned Kenlyn Aisha (Inkouredible X Mahoganaska), owned by Linda. To say Steve is a Kenlyn Arabians fan is an understatement. "Linda has been the best support all along, particularly loving the National Championship ride with her horses and her granddaughter! This has been and is a fun ride!" Linda currently stands two stallions at Kenlyn Arabians. Linda bred, raised, showed, and stood for breeding her now-27-year-old stallion, Awesome Knight (Bask Knight X Na Tabarrok, by Comar Regal). "He's beautiful, and he's bred well. My little daughter used to handle him all the time, taking him to the 4H and AHA shows. His temperament is wonderful." Linda's 'up-and-comer' stallion, Kenlyn Psyclone (Psky FA X Destin Tu Be, by MCA Cardigan) is just 7. "He's out of one of my well bred endurance mares, and I've only done one thing with him. I took him to one show when he was just 4. A dressage trainer from my barn rode him, and he won the training level and first level and regional championship in his only show." Normally, Linda would produce around 20 foals each year, but she's cut back the last couple of years because of her bad knees (which she just had replaced). "I believe when these babies hit the ground, they have to be handled and worked immediately. They need to be led, loaded in the trailer, taught to tie, their feet picked up, and handled all the time, and right now I can't do that. I knew I couldn't do it this year, and probably not until next year." So while there will be a kind of a 'dry spell' for new Kenlyn Arabians for a couple of years, Linda still gets her thrills watching the current Kenlyn get going down the trail, and enjoys watching some of her home-bred horses grow old in her pastures. "Right now I still own probably 40 horses, but over half of them are in their 20s. I kept a lot of my old mares, and I'm letting them retire in luxury. We've got to take good of the old famous ones, and the not-so famous ones. "I want to thank my husband of 46 years, Ken, for his belief and support of my dreams. Without his help, I could not have achieved my successes. "It's really exciting. It's been what I call a great 50 years of breeding."